In lieu of flowers the family asks that memorials be directed to both St. Anthony Catholic Church or Spalding Catholic Schools. Mass of Christian Burial will be 10:30 a.m. Monday, April 8, 2019 at St. Anthony Catholic Church in Hospers, with Father Dan Greving officiating and Deacon Dan Goebel assisting. Burial will follow in the St. Anthony Cemetery in Hospers. Military honors will be conducted by Reuter Post 0423 American Legion of Hospers. Visitation with family present will be 3-7 p.m. Sunday. There will be a rosary by the Knights of Columbus and a vigil prayer service all at 5 p.m. at St. Anthony’s Catholic Church in Hospers. Visitation will resume 9:30 a.m. on Monday at the church. Services have been entrusted to Fisch Funeral Home & Monument in Remsen. James was born on March 22, 1934 to Lawrence and Agatha (Stapenhorst) Auchstetter in Hospers, Iowa. He was raised in Hospers, receiving education from St. Anthony’s Grade School and Hospers High School graduating in 1952. In 1954 he entered the U.S. Army and served in Alaska until his honorable discharge in 1956. James married Louise Freking on April 8, 1961 at St. Anthony’s Catholic Church in Hospers. The couple made their home in Hospers. James worked for Iowa Public Service from 1962-1982. He also attended Sioux Empire College graduating in 1976. James began working at Ambank Insurance and Hospers Real Estate from 1982-1999. 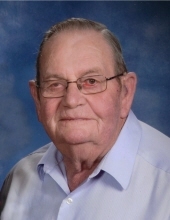 He was a member of St. Anthony’s Catholic Church Hospers and also served on the church board and Spalding Catholic School board. He was also member of the Knights of Columbus. James was a volunteer fireman for 15 years and also served on the city council and Hospers Development Corporation. James liked to farm, hunt, fish, travel with his siblings and wife, read and have coffee. Faith, family, and friends were important to him. Survivors include: his wife, Louise of Hospers; his four daughters, Jeanne (Tom) Jungers of Hospers, IA; Julie (Steve) Hunt of Granville, IA; Nancy Ellison and Tim Seep of Vermillion, SD; Amy (Mike) Matuska of Zumbrota, MN; 14 grandchildren, Jessica Jungers, Alex and Amy Jungers, Lauren and Joe Kelling, Emily and Mike Bakker, Megan and Sean Moore, Anthony Hunt and Rob Humble, Anna and Jacob Kooiman, Jaime Hunt, Ellen Hunt, Mitchell and Jackie Ellison, Timothy Ellison, Jackie Matuska, Tara Matuska, and Joel Matuska; 3 great-grandchildren; his sister, Marcene (Fran) Moran of Sioux Falls, SD; 4 sisters in law: Sister Edwardine Freking OSF of Dubuque, IA, Catherine Portz of Hospers, IA, Sister Angeline Freking OSF of Dubuque, IA, Marie Klein of Alton, IA; brother-in-law Leo (Karen) Freking of Hospers, IA. Preceded in death by: his sister Lorraine and her husband Vincent Becker; Brother Marvin and wife Marlys Auchstetter; two brothers in law Bernie Portz and Oscar Klein. Casket bearers will be: Alex Jungers, Anthony Hunt, Mitchell Ellison, Timothy Ellison, Joel Matuska and Steve Auchstetter. To send flowers or a remembrance gift to the family of James Auchstetter, please visit our Tribute Store. Visitation with family present will be 3-7 p.m. Sunday. There will be a rosary by the Knights of Columbus and a vigil prayer service all at 5 p.m. at St. Anthony Catholic Church in Hospers. Visitation will resume 9:30 a.m. on Monday at the church. "Email Address" would like to share the life celebration of James Auchstetter. Click on the "link" to go to share a favorite memory or leave a condolence message for the family.